In recent years, new disease threats—such as SARS, avian flu, mad cow disease, and drug-resistant strains of malaria and tuberculosis—have garnered media attention and galvanized political response. Proposals for new approaches to “securing health” against these threats have come not only from public health and medicine but also from such fields as emergency management, national security, and global humanitarianism. This volume provides a map of this complex and rapidly transforming terrain. 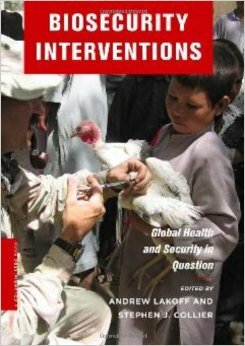 The editors focus on how experts, public officials, and health practitioners work to define what it means to “secure health” through concrete practices such as global humanitarian logistics, pandemic preparedness measures, vaccination campaigns, and attempts to regulate potentially dangerous new biotechnologies. As the contributions show, despite impressive activity in these areas, the field of “biosecurity interventions” remains unstable. Many basic questions are only beginning to be addressed: Who decides what counts as a biosecurity problem? Who is responsible for taking action, and how is the efficacy of a given intervention to be evaluated? It is crucial to address such questions today, when responses to new problems of health and security are still taking shape. In this context, this volume offers a form of critical and reflexive knowledge that examines how technical efforts to increase biosecurity relate to the political and ethical challenges of living with risk.